Stabbing, burning, and shooting pain are classic signs of spinal disc and sciatic problems. Many Americans suffer with disc issues, but luckily, the right treatment is incredibly effective. Your spine consists of a stack of 33 vertebrae, each with a disc in between. The disks are made of a thick fibrous outer lining and a soft core containing a gel-like substance. These discs act as shock absorbers between the vertebrae. 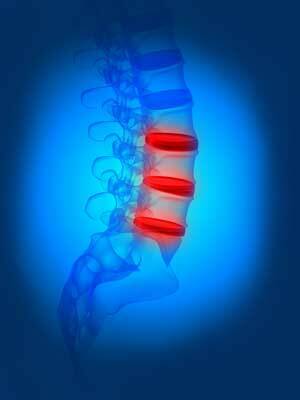 The disc should be thick to create a good space between each vertebra and allow the nerve impulses to flow freely. The spine plays an extremely important role in our bodies. Unfortunately, there are a host of spinal disc and/or resulting nerve problems that will cause back pain and interfere with day to day activities. A condition affecting the spine, in which a slight protrusion of the disc is apparent but has not yet herniated. The protrusion, in some cases, can apply pressure to a nerve(s) causing back pain. A condition affecting the spine, that begins as disc bulge but created so much pressure on the outer wall of the disc that a rupture occurs allowing the gel-like, inner core of the disc to leak into the spinal canal. In most cases pressure is applied to nerve(s) causing chronic back pain. A painful symptom that may be caused by general compression and/or irritation of one of five nerve roots that give rise to the sciatic nerve, or by compression or irritation of the sciatic nerve itself. The pain is felt in the lower back, buttock, and/or various parts of the leg and foot. A condition in which the spinal canal-the spaces through which the spinal cord runs- narrows and compresses the spinal cord and sciatic nerve roots. A common condition that occurs when the spinal discs begin to break down, often causing severe back pain. Low back pain, sciatic pain, and disc herniation can become debilitating. Luckily, there are treatments for such issues that provide phenomenal results! In our specialized disc treatments and nerve repair treatments, an 86-92% of improvement is seen with disc herniation. 86% of sciatic sufferers had “good” to “excellent” relief, and 94% felt good even a year after treatment.